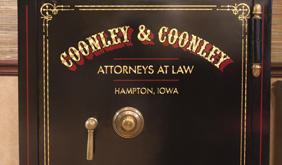 Coonley & Coonley is a general practice law firm, however, a majority of the work of the firm is wills, trusts, estate tax planning, probate, real estate, corporations, limited liability companies and business transactions. We help clients arrange for the ultimate disposition of their property, either by will or by trust, with the overlay of any estate tax concerns which may need to be taken into consideration. Much of this work also involves succession planning components, usually with regard to farm operations. In this connection, we assist clients in determining the need for general and medical powers of attorney and living wills. Upon death we assist in the winding up of the affairs of the decedent, whether through formal probate or otherwise. We help clients buy or sell real estate, including the preparation of contracts, deeds, disclosures and opinions of title. 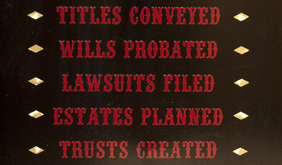 We can also procure title guaranty, if desired. We have a good working relationship with all area lenders and realtors. We employ an auction procedure for selling of farmland for public sales, or help arrange private sale of all types of real estate. We form entities such as corporations and limited liability companies when necessitated by business, tax or liability concerns, either independently or in conjunction with the tax advisor for the client. We also prepare the necessary documentation to keep the records of the entity up to date and in compliance with applicable rules and laws. We help clients buy or sell businesses, either by way of sale of assets or sale of stock, along with the preparation of all necessary agreements. This is done independently or in conjunction with the tax advisor for the client. We prepare all types of contracts and agreements typically used in business transactions. We welcome initial consultation in all areas of the law. In the event that the client needs legal services outside of our typical practice areas we will attempt to refer the client to an attorney in their specific area of need. We maintain an informal network of attorneys who handle most other types of legal issues, including worker’s compensation, personal injury and wrongful death.